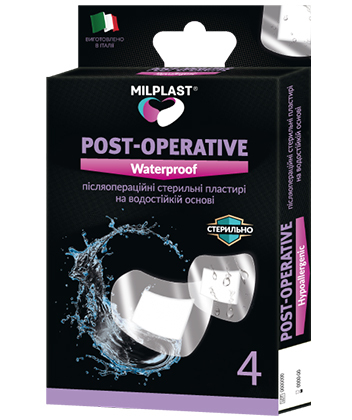 Milplast POST-OPERATIVE (Waterproof) was developed specifically to protect post-operative sutures and wounds from water and moisture ingress. A special sorрtive pad absorbs all the liquids that are released by the wound after surgical intervention. Due to a fully waterproof base, the plaster allows the patient after the operation to take a shower, as it fully protects the postoperative wound from wetting, even with strong water flows. Remove from the skin not earlier than an hour after contact with warm water. - Sorptive pad with protective mesh preventing wound adhesion. All materials used for plaster manufacturing have hypoallergenic properties. 3. Gently fix the plaster on the skin, pressing only the edges to the skin, not to injure suture or wound. 4. Remove the blue protective strip. Only for external use! Do not leave skin more than 24 hours. L'hypoallergénicité des matériaux réduit la probabilité de réactions d'hypersensibilité, mais n'exclut pas leur survenance. Keep dry, at room temperature. Do not unpack unless necessary. Copyright © 2016-2019 Miltonia Health Science. All the respective rights reserved.